EASTER HOLIDAYS ARE UPON US! For Unusual or Larger Orders, please order by Thursday 11th April for delivery pre Good Friday. We will be closed from 4.30, 18th April. We are specialist paint manufacturers and suppliers. Please note we are not decorating contractors and do not provide a painting/application service. Please contact us now to place your order or for a quotation: 01202 295 570. NOW is the time to think about site maintenance and refurbishing existing floor surfaces. Call us now on 01202 295570. If you are suffering with “Solar Gain” (greenhouse effect) from a glass, asphalt or metal roof, see our Solar Reflective and Anti-glare water based or solvent based products. 2018 was a stunning summer both for lucky pool users and for our pool paint sales…our highest to date for all types of pool products. This period included the supply of paints for an unusual spring-fed pool at the New Bath Hotel & Spa in Matlock Bath, pictured. 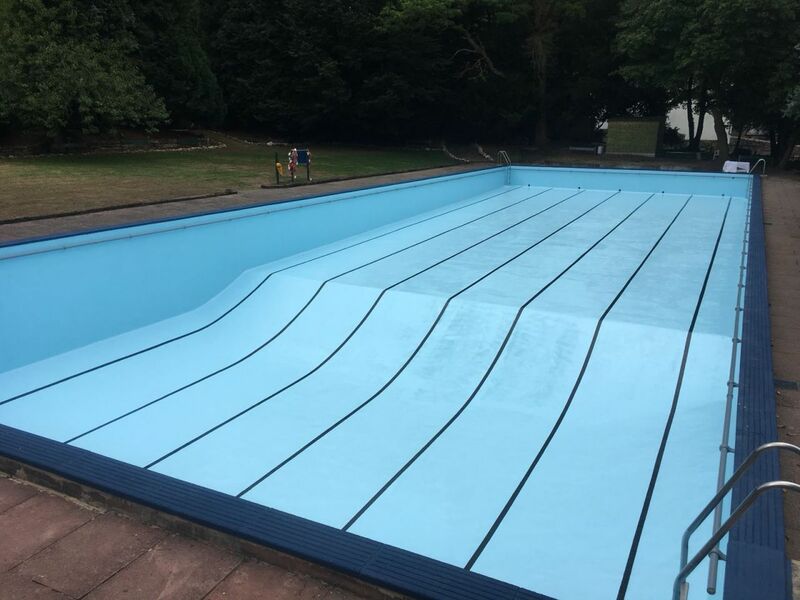 They used our A148 Chlorinated Rubber in the pool "tank" in BS18E51 along with black lane lines. The outer concrete edge was painted with A148 Fine Anti-slip in a bespoke dark blue. Click Here to see Tony Robinson introduce this fun renovation on video. Technical Paints offer a full free advisory service to help you before you paint. Just email us with a broad outline of your project, ideally with photos to show the condition of the substrate. We will assess your situation and give you our recommendations along with a painting specification and timings to help achieve your end result. If the condition of the substrate is too damaged or outside of our product range, then we will advise you accordingly. If using paints in communal situations or areas of high use, remember water-based coatings don’t smell as much as solvent types. We do however have a comprehensive range of both. We offer a comprehensive range of paints and performance coatings for most situations and surfaces. Many are in stock and others, plus Special Mixes, are made to order within a few working days. With new resources, new raw material suppliers and increased sales, we are now able to offer a faster turnaround on our most popular products. We are pleased to receive enquiries of a technical nature. Call us on 01202 295 570 or email us with your enquiry. 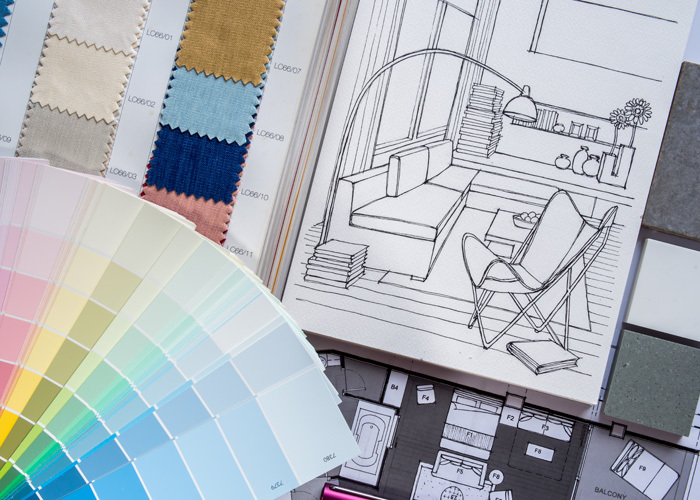 Once you have established the ideal end-result for your project, refer to our Substrate Index for product options and take a few invaluable moments to read our Painting Guides - see below. We have a vast range of mainstream and specialist products suitable for industrial, commercial, coastal, rural or city environments. We also have over 70 years of expertise to call upon so we rarely come across a requirement we haven’t seen before and we can supply both water based and solvent based systems for professional and trade use. We are stockists of Fertan Rust Converter - Buy Fertan here! "We would just like to say how delighted we are with your pool paint and your service. My husband says it's the best paint he's ever used and we have a very large pool, so it's a big job. Good stuff everyone, and many, many thanks." 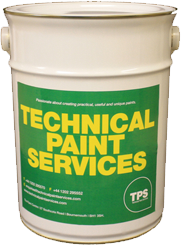 Technical Paint Services is an independent, specialist paint manufacturer and supplier, offering a range of specialist paints and coatings, trade paints, a technical paint advice service with in-house chemists and product development. Please call us, email or fax with details of your enquiry or order. When using EMAIL, PLEASE provide as much information as possible with regard to the surface to be painted, such as new or old, previously treated or bare, the environment (such as a humid pool area or a floor with high levels of traffic/footfall), etc. Thank you. Technical Paint Services is the trading name of Neatcross Ltd.
Popular, specialist paints include Swimming Pool Paint, Swimming Pool Hall & Enclosure Paint, Squash Court Paint and Tennis Court Paint which are available in the majority of colours and finishes across the BS4800 and RAL colour ranges. There is a demand from decorators for alternatives to lead-based paints which we are pleased to manufacture and continue to offer as excellent options to lead products; please see our A49 range. Our latest PRICE LIST is available to DOWNLOAD.